What’s Scarier: Expensive Bacon or Our Food System? There’s currently a virus taking a toll on hog farms in the U.S. and Canada. Since last spring when it was first detected in Iowa, porcine epidemic diarrhea, or PEDv, has killed about 1 million baby pigs. While that’s a small percentage of the approximate 66 million pigs in the U.S., there has been much talk of rising pork prices. Because you know what pigs mean: Bacon. And if there’s anything we should get really concerned and riled up about, it’s a rise in bacon prices. Meanwhile in Germany, farmers protested a proposed trade agreement between Europe and the U.S. that would lift restrictions on American meat sold in European countries. A gathering of pigs outside of Angela Merkel’s office building to underline the commitment to sustainable as opposed to industrial farming. The lesson? We are talking about these kind of things in the wrong way. We support an industrial food system that, in this case, keeps animals in tight quarters, limiting hygiene and health, and when a widespread virus hits, we question whether or not the price of food will increase. It’s not the increase in the price of bacon that we should fear, it’s our industrial food system that gets us into this position in the first place that we should be questioning. The pig industry is a dirty business. Nowadays, most of the swine we consume are raised on Concentrated Animal Feeding Operations. In fact, to call these places “pig farms” is a terrible use of the term. These are pigfactories. 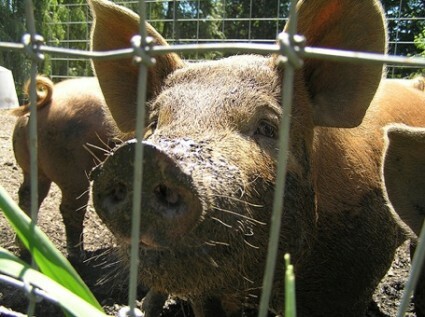 Between 1997 and 2007, the number of hogs raised in factory farms grew by one third. That comes out to about 4,600 additional hogs per day. Besides affecting the health of the animal, these factory farms have a severe impact on the environment. Manure spills from these factory farms, that often seep into waterways, often release more sewage than the equivalent human sewage of a metropolitan area. But we turn and look the other way, happy with our “bacon on everything” menus. Even John Stewart is reminding us to think about where our beloved bacon with a capital B comes from. If you think pigs are raised in comfy stalls with lots of hay, think again. Breeding sows often only have enough room to lie down and stand up. Pigs can live up to 15 years, but often they’re slaughtered at six months. By eating, and eating without thinking. Everything we put in our mouths has an impact. The more cheap meat you consume, the more factory farms will grow. In the end, a rise in the price of bacon could be a good thing; we should all be eating less meat and thinking more about where it comes from. Concerned about your price in bacon? You should be more worried about how that bacon was made.